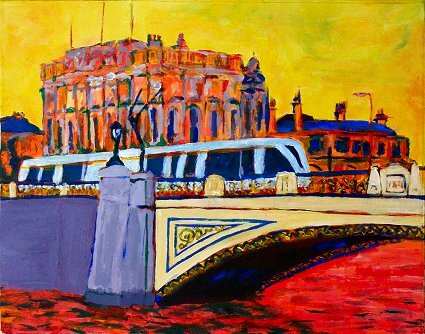 Being the westernmost bridge over the Liffey in Dublin’s city centre, Heuston Bridge was 1st to make an impression on me, a Dub from the suburbs of Dublin West. When the largely unremarkable Frank Sherwin Bridge was built beside it to take its traffic it simply meant that for me walking home from town I now had a new bridge to walk across from which to view the older bridge, before then walking across Heuston Bridge itself. Walking home from town for me can be quite a long affair. And who doesn’t love Heuston Station? If you’re known to me you can pay me direct (cash, cheque/check, or bank transfer) - which also happens to save me paying PayPal fees, but by all means please use the paypal links below if it suits you. Note: this painting is a bit more expensive that others of a similar size - because there was considerably more work involved. Heuston is part of the End of Year 2009 online sale of paintings, which has launched with paintings at half-price and FREE shipping worldwide until Christmas Eve. Loads of new paintings are being rolled out on my personal blog Bicyclistic in batches. To see announcements first follow me on twitter.